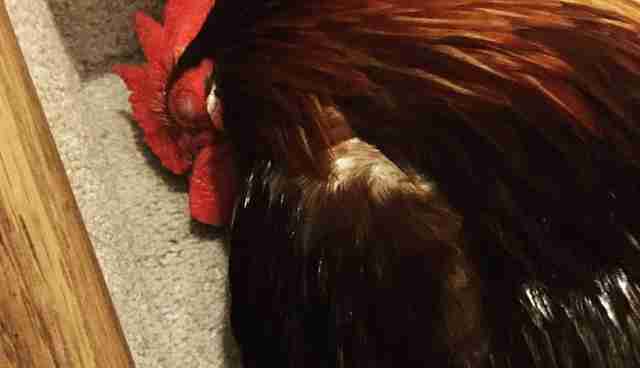 Every morning, a rooster rises from his perch on the couch, marches up two flights of stairs, hops on the bed and positions his head about 3 inches from the faces of the sleeping humans. Then he screams at them. "He doesn't cockledoodledoo," Rara Subramanyan, his owner, tells The Dodo. "There is no doodle in it." 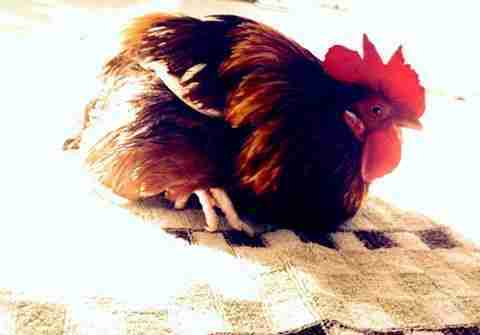 This morning drill is just one of the many joys of sharing a home with a rooster named Mr. p-Blizzard. 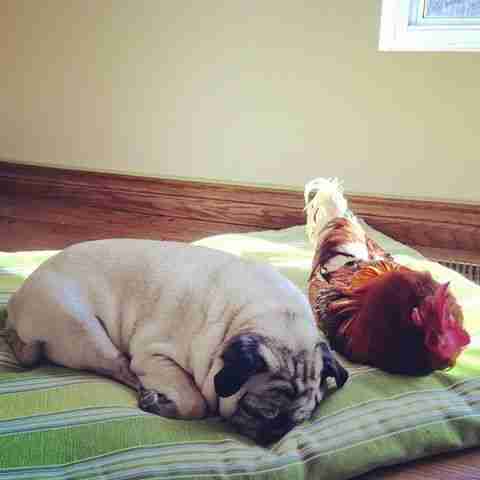 It's a rooster's world. Subramanyan, her husband, Brian Kelly, their two children, three cats and a pug are only living in it. As far as supernaturally strange roosters go, p-Blizzard's origin story is as epic as the life he leads. He was found under a car with no wheels in a junkyard. In the middle of a blizzard. 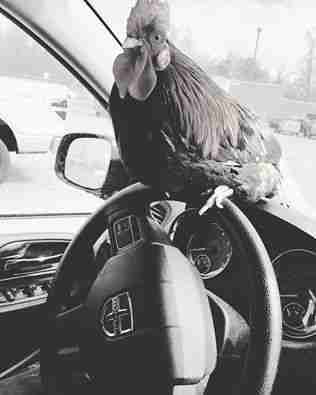 Subramanyan and Kelly were driving home from a potluck dinner in November 2014, when they heard about a stray rooster through the animal rescue network with which they're involved. They stopped in Erin, a town just northwest of Toronto, Canada, where the bird had been last spotted. 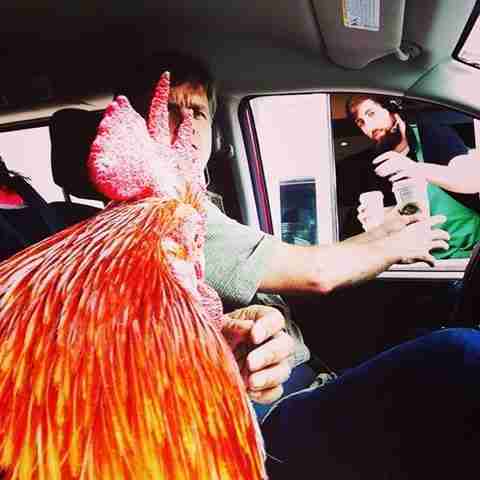 Then they asked a police officer in front of a nearby coffee shop if anyone had seen a rooster. "He was totally stunned by the question," Subramanyan recalls. Eventually, they were led to a broken-down car. Crouched beneath it was p-Blizzard. No one knows where he came from. Did he survive a fall from a passing truck? Was he a slaughterhouse fugitive? The only equipment the couple had with which to capture the rooster was a pair of oven mitts from the potluck dinner party. "We scared him out of there and Brian ran after him with the oven mitts on and caught him and took him home," Subramanyan says. The legend of p-Blizzard began. "I asked Brian if we could keep him for a little while," she recalls. 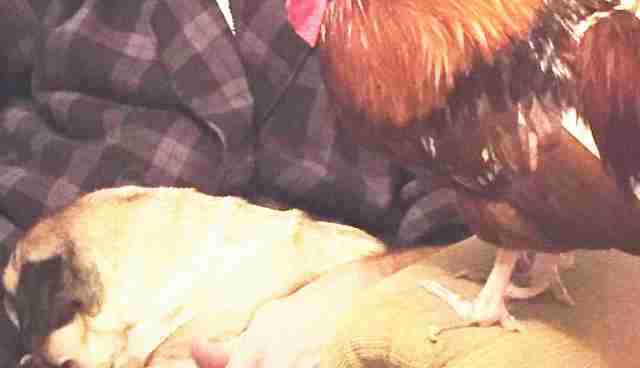 "Then I looked around wildly on the internet to see if anyone could keep a rooster. 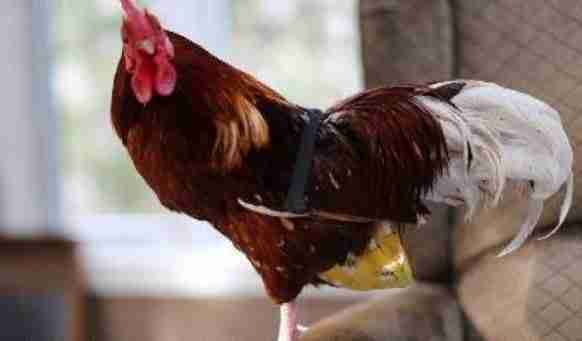 I found house roosters and that there are things called chicken diapers - and ordered them." Today, p-Blizzard sports a dazzling collection of diapers: lightning bolt diapers, flame diapers, cartoon diapers. They don't undermine his authority in the least. In fact, he may wear diapers, but it quickly became apparent p-Blizzard also wore the pants in the family. Today, the rooster keeps the household to a sharp timetable and all of its occupants accountable. "He sleeps in the house and considers us his flock," Subramanyan explains. "He's only three-and-a-half pounds but has a lot of personality." In fact, p-Blizzard has at least 25 sounds he uses to communicate all his wishes. "They all mean something different," Subramanyan explains. "He will crow in the morning, usually not before 7 o'clock. He crows when somebody enters the house. He crows in the evening, as if to say, 'Everybody, it is evening time, cool it.'" "He has a bark sound," she continues. "A yummy food sound." Even when he makes no sound at all, he commands respect. "All three cats and the pug treat him like he calls the shots," Subramanyan says. "And every dog gets 'the eye' when they first come inside." When the mood suits him, p-Blizzard is not opposed to waging a little psychological warfare. Sometimes, he will be found on the stairwell. In a deep sleep. Scaring the bejesus out of his mom. And sometimes, when a dog is lying on the floor, p-Blizzard might pretend to be eating food very close to his head. No reason, really. Just pecking at the ground around the dog's head. Likewise, every newcomer to the household is greeted with skepticism. Not paranoia, mind you. Paranoia is for hens. Just a little healthy skepticism. And, sometimes, a little something extra. Once a friend brought a big dog to the house for a visit. p-Blizzard may have done something - who can say just what? - to make the dog uncomfortable. When the dog tried to approach Subramanyan for a little support, p-Blizzard sprang into action. "P-Blizzard ran over to him and body-checked him like a hockey player," Subramanyan says. But p-Blizzard is no bully. He just likes things a certain way ... for everyone in the household. P-Blizzard is even particular around those who share his home. Like Possum the Pug. 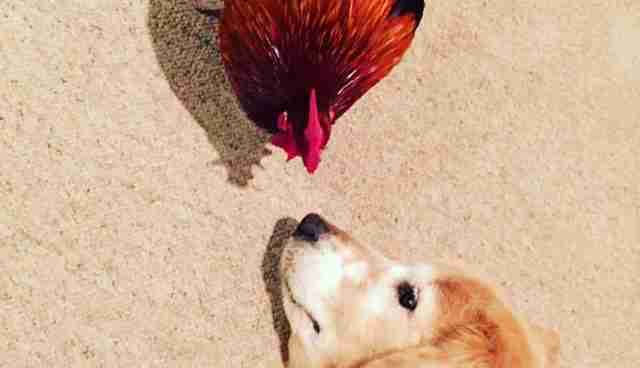 The rooster's relations with the family dog didn't get off to the most promising start. It turns out, Possum just needed a little time to get the memo. p-Blizzard eventually learned to appreciate the pug's service - and maybe even feel something that outside observers call love, though they would never utter this aloud in the rooster's presence. "It went from a hostile relationship on his end," Subramanyan says, "to following her and sleeping next to her." In fact, if p-Blizzard can be a dictator at times, he's a gentle dictator. A diaper-wearing dictator. "He's the gentlest guy," Subramanyan says. "You can touch his beak or wattle. 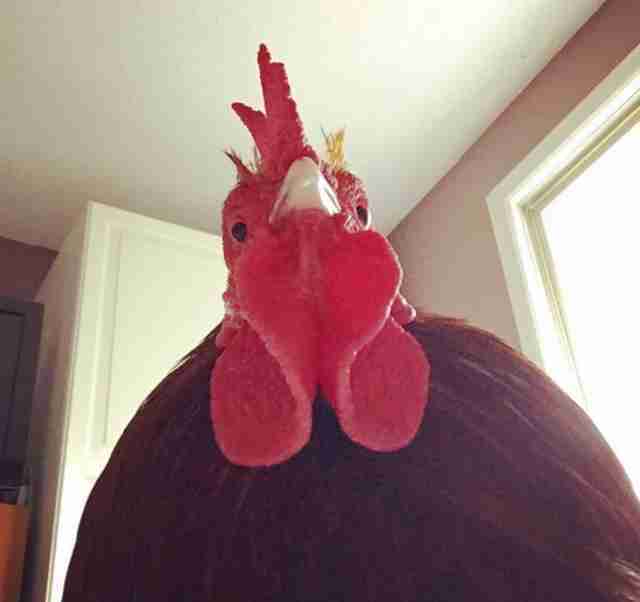 He has never pecked a human." It's almost as if p-Blizzard just wants to keep the people he loves tolerates safe. Just as his soon-to-be family rescued him that cold, snow-swept night in November 2014, so too will he rescue them. By keeping them punctual. And honest. And well-groomed. "He pecks affectionately," Kelly says. "And to take out gray hairs." 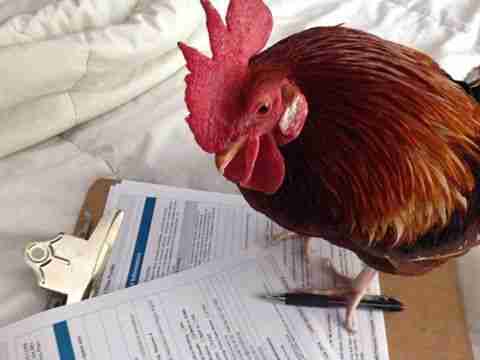 This rooster has found his calling. You can follow p-Blizzard's continuing adventures on Instagram or on his Facebook page.